Note 2: ASE License: I have linked to the newest license in this separate blog, so that when the license location is updated, I can simply update this one blog. Please bookmark it: ASE License Available . Please note, however, that we are currently experiencing Sharepoint issues. I will update the blog asap. The download provides the software required to install and run SAP NetWeaver Application Server ABAP 7.51 SP2. You can explore it and learn how to develop modern ABAP applications with core data services and SAPUI5 or you can get an overview on SAP’s client/server technology. Just like the versions we offer in the Cloud, this developer edition is preconfigured to run to run the Database Feature Gallery and the Enterprise Procurement Model programming examples out of the box. You need to read and accept the SAP Software End User License Agreement. Since this is a free product, we cannot offer official primary support. However, we will attempt to answer queries pertaining to installation issues. Since we have documented Oracle VirtualBox only, we are more likely to be able to help you with this VM technology. Other distributions may require manual setup. NB 1: You must use a 64-Bit OS version. NB 2: Linux newbies don’t run away! We have written thorough, step-by-step instructions on how to set up a Linux VM and how to run the AS ABAP installation. They are available at the end of this blog. Again, we cannot offer official primary support. However, we will attempt to answer queries pertaining to installation issues. Since we have documented openSUSE only, we are more likely to be able to help you with this distro. Do this version has licence issue like the previous one ? When the licence will expire ? 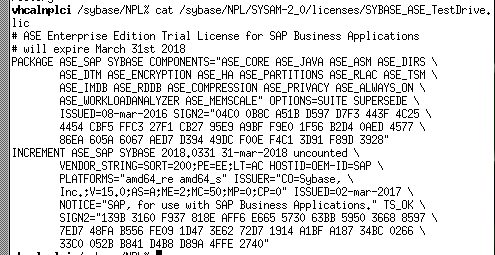 This is not a SAP AS ABAP license; it is an ASE license. Mine expires 18. March, 2018. I can confirm what Julie said, there is no ASE license issue with this download. The current license is set to expire 18th March 2018. Some reference in this blog are wrong (750 vs 751) (the first sentence in this blog for example, and also some hyperlinks between the blogs). It would be great if you correct that, as 6 Blogs referring to two versions can get confusing…. Thanks for all the feedback. I have corrected the errors. Re: Transporting objects: I replied to your thread on this some time ago; did you see it? A working “Access key” for the user DEVELOPER would be nice. You can install the new license then you don’t need the developer’s access key. This SAP Front End patch cannot be applied. Either the installed components are already on the same patchlevel or the components to be patched are not installed. Would be possible to ask you for help ? Try installing the update included in the installation files. Started with the installation of SAP netweaver developer edition but it fails with the following error. Please please help us improve searchability by creating new questions in the ABAP Development forum. Please include the tag #ABAP_Trial. I can’t promise to help but will do my best after vacation (1week). I already downloaded the part8 file again and the error persists. As the download of the rar files is too slow for me, it would be easier if I could check which file is not OK and should be downloaded again. Please include the tag #ABAP_Trial. I can’t promise to help but will do my best. The licence is valid until end of March 2018 but I get the NPL error as well. I WILL shortly be closing comments on this blog. Great blog amazing I have install the VM the SAP instance and now I can connect to the SAP System in my VM Virtual Box. So on little thing I didn’t find, where can I find the development key? When I will programm my first APAP code I Need this Key. I’m allready one key but not for this VM installation. Hi Luc, We have hard-coded one developer key, for the user DEVELOPER. If you log on with this user, you should not need to enter an access key manually. Hi Luc, I see from your other post that this one does not work. Please follow the instructions in the other post. I don’t want to demotivate Mac Users but why don’t we have included the SAP GUI for the Java Environment 7.40 for Linux ? thanks the installation manual works perfect. This is the Date I entered: 20.03.2018 (it was 20.02.2018). When I change only the day it works fine. Do you have any idea, how I can fix that problem? Hi Nils, Sorry, issues with a specific transaction are well beyond our scope. I suggest you post a question in the relevant forum for SM36. Is there any Data in the system at all? Yes, loads ;-). Try opening a package, eg SAPBC* or SABAP*DEMO* or SEPM* (or maybe S_EPM*, sorry, can’t check right now) and looking at the tables ( / data elements, etc). What we don’t have is any ERP / Business Suite system data or transactions. I cannot access the ASE License 2019 on the SAP SharePoint Server – would you please help me? me too, I can’t access the License for 2019 on the SharePoint Server. It looks like you’re hosting the file within SAP’s internal sharepoint which the public cannot access. Could you please upload this file so everyone has the ability to access the file? Hi Julie, sorry but the link has the same problem that Rob said, can you please help me ? the license is about to expire. Will there be a new license file or will you release a new version (and when)? Yes, The new license is available here: ASE License 2019 .
behind your link is still the old license file, which expires today. this is still the old file. The URL link is not working now ? Please advise where to find and download the proper license file ? Thanks and best wishes Julie. Can you provide access to valid license key until september 2018. Seems the link is the old license file. I know this is an older blog post but couldn’t find a more appropriate newer one sorry. Anyway, I’m not sure if this relates to the move of the download files to origin.softwaredownloads.sap.com but I’m on one of the fastest domestic internet connections in Australia, but downloads are going on average at 50kb/s which equates to each file taking around a full day to download (I’ve tried this on 3 separate occasions to see if it’s temporary). Now while I understand this is all free; let’s compare this with the full HANA download. This download completes in under an hour for me and it’s a bigger download! So my question: Since this is obviously related to the hosting platform, is there anything that can be done about this as it would just take one restart, sleep, etc; to cancel the download hence this sort of friction means I will probably not install it (or try get someone to give me the files when I’m at TechEd)? Sorry am just back from vacation. We are currently focussed on getting 7.52 out the door asap, but I have passed this on to the downloads team; they responded almost at once; they are currently investigating. Theteam have informed me that they have moved the files to a faster server. Could you please re-test and let us know? Thanks Julie. I tried to follow the bouncing around from the link to download this (ended up here – https://www.sap.com/developer/trials-downloads/additional-downloads/sap-netweaver-as-abap-developer-edition-sp02-7-51-14493.html) but after avoiding the html rendering issues, I end up at a download page where it says file not found??? But still hopeful for the faster download when the next version is released (I have the old slower download version finally working after a few days of downloads. I asked to move these files to the list of files will be fast download. I hope it will be done before the weekend. Once done I hope there won’t be any download problems anymore. Thank you for letting us know- i’ll let the IT know ..
I’m getting the error below, I’ve already put the file with the new expiration date in the same location as install.sh The error continues …. What can I do? is “https://go.support.sap.com/minisap/” to get a license down? Some users are having issues, some not. Can you try: https://go.support.sap.com/minisap/?sap-ui-debug=true#/minisap ? hi, it’s possible to install NetWeaver directly on windows Server 2012? i don’t find a way how to install it? No, if by “NetWeaver” you mean the AS ABAP 7.5x, then no, this is Linux-only. I am having trouble extracting my file, nearly all of the files I downloaded are corrupt, it took me all day. can anyone tell me why these file are corrupts, except file one.